« NRA Life Membership for $600, beat the Price Increase – Extended, don’t know how much longer! 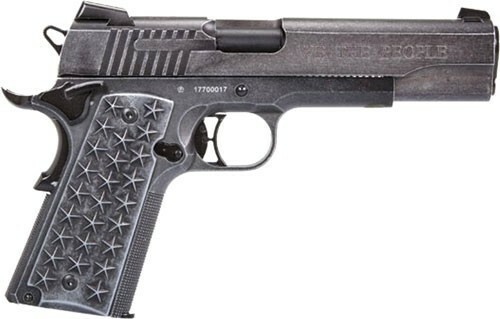 SIG has paid homage to the rights of all Americans which are protected by the United States Constitution, with their new 1911 “We The People” commemorative pistol. 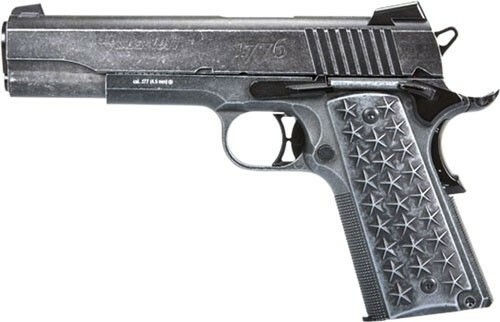 This true to life replica of that pistol includes every detail that is on the original, with the added benefit of being able to purchase one. Engraved on the slide is “1776” and the phrase “We The People” on the other, which is the opening to the Bill of Rights. The handle has 13 stars on each side, representing the original colonies. This CO2 version is powered by a 12 g cartridge and uses a 17 round BB magazine, which throws rounds down range at 340 fps. Like the firearm it is replicating, this version can also be field stripped and features blowback action.